Talk about many are mad only few are roaming! 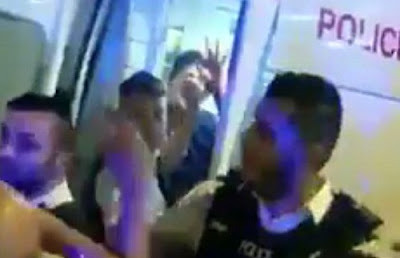 The Finsbury Park mosque terror suspect has been filmed blowing a kiss and waving minutes after he mowed down a crowd and shouted: 'I want to kill all Muslims - I did my bit'. The alleged killer used a white van to intentionally mow down a group leaving Ramadan night prayers, killing one and catastrophically injuring at least 10 more. Witnesses said an elderly man had fallen ill because of the heat and a group from the mosque stopped to help him when the vehicle hit them 'deliberately' and at high speed at 12.20am. The driver, 48, who is white was pinned to the ground by an Imam from the mosque who urged the angry crowd not to hurt him so the police could arrest him. Police arrived and they put him in a police van but the terror suspect was then filmed blowing a kiss to people looking at him inside after he waved on entering the vehicle. This appears to be the fourth terror attack in Britain in the last four months, claiming 36 lives so far.